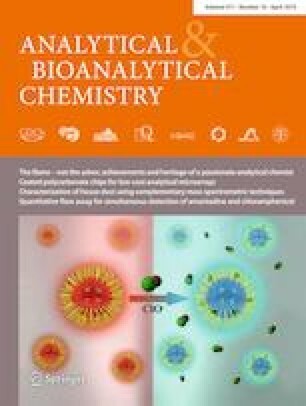 The aim of this research was to develop a method for simultaneous quantification of proteins and main polyphenolic compounds extracted from oleaginous meal by aqueous media. 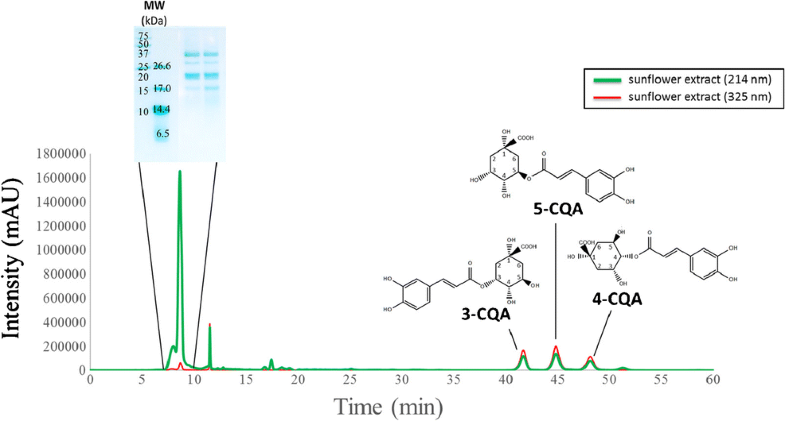 Size exclusion chromatography with a Biosep column (exclusion range from 1 to 300 kDa) and acetonitrile/water/formic acid (10:89.9:0.1 v/v) eluent at 0.6 mL min−1 yielded the most efficient separation of sunflower proteins and chlorogenic acid monoisomers (3-caffeoylquinic acid, 5-caffeoylquinic acid, and 4-caffeoylquinic acid). After a study of the stability of the extract components, the incorporation of a stabilization buffer (0.5 mol L−1 tris(hydroxymethyl)aminomethane-hydrochloric acid/1.0 mol L−1 sodium chloride at pH 7) was proposed to avoid polyphenol-protein interactions and/or isomeric transformation. The use of 214 nm as the wavelength for protein quantification was also included to minimize the effect of interference from polyphenol-protein interactions on the quantification. Under the used experimental conditions, the protein and chlorogenic acid monoisomer signals remained stable during 300 min at 20 °C (95–125% of the starting value). The developed method was validated and parameters such as specificity, sensitivity, precision, and accuracy were determined. The results from size exclusion chromatography correlated well with the results of protein determination by the reference Kjeldahl method. The proposed method was successfully applied for rapeseed extract analysis making simultaneous quantification of proteins and major rapeseed polyphenols (sinapine and sinapic acid) possible. The online version of this article ( https://doi.org/10.1007/s00216-019-01635-2) contains supplementary material, which is available to authorized users.